What if Willamette River water went to farmers while farmers allow municipal agencies to use water captured in Oregon’s Coast Range for drinking water and river cooling? That is exactly the question this study seeks to answer. This option would build a pipeline from the Willamette River near Newberg to Forest Grove. The piped water would either serve the Tualatin Valley Irrigation District (TVID), or be delivered to the JWC Water Treatment Plant (WTP) for municipal supply. This project would be very similar to the Mid-Willamette Option if the second alternative was chosen. The piped Willamette River water would be delivered to the JWC plant for treatment and then sent on to the residents of Washington County. However, a more innovative approach to this project would be the first alternative of this option. A pipeline would be built to deliver Willamette River water to the TVID intake in Forest Grove. JWC and Clean Water Services would enter into a purchase agreement with TVID to exchange Willamette Water for TVID’s contractually stored water in Hagg Lake. This option would allow farmers in Washington County to use Willamette River water for irrigation and Hagg Lake water could be used for drinking water and flow augmentation in the Tualatin River. The first alternative to this project contemplates exchanging water from the Willamette River for water in Hagg Lake. The exchanged Hagg Lake water would be used for drinking and flow restoration. During summer and fall months, the JWC WTP already provides high quality drinking water from water stored in Hagg Lake. This alternative would have the benefit of allowing additional releases of relatively cool water high within the Tualatin Basin to help address temperature issues within the Tualatin River. The Willamette River has proven an excellent water source for some time, which is why it is considered a viable second alternative. Both the cities of Corvallis and Wilsonville have diverted water to drinking water treatment plants for several years to serve their communities. The study is developing cost estimates for this option. Results are expected in fall of 2011. If a decision is made to pursue an exchange with TVID, costs of a purchase agreement would be negotiated at that time. Both alternatives would require an expansion of the JWC WTP. Additional treatment options, such as enhancing the conventional treatment plant with an ozone treatment component, would be considered. If the exchange alternative is pursued, there are 27,000 acre feet of water in Hagg Lake under contract to the Tualatin Valley Irrigation District. That amount of water is not enough to meet all the municipal needs in the Tualatin Basin for 50 years, but may provide a shorter-term supply. The study has considered multiple regulatory issues and, to date, none of them present a barrier to the project. New water right -- The Oregon Water Resources Department (WRD), which is the agency that grants water rights, has determined that there is water available at this location in the Willamette River to be taken out for drinking water or other uses. Still unknown are what environmental actions WRD may require, as part of the conditions for a new water right. Obtain an existing water right -- It may be possible for Hillsboro to purchase an existing water right from a willing seller in the Willamette Valley. The City could then transfer that right downstream near Newberg to be used for Hillsboro’s future water supply. The study is currently evaluating opportunities that fall into this category. Obtain a Willamette storage contract -- The U.S. Army Corps of Engineers (USACE) operates 13 dams in the Willamette Basin that store 1.6 million acre feet of water. Currently, a number of farmers in the Willamette Valley have contracts from the federal government to use a small percentage of that stored water once it is released from the dams. Municipalities are currently working with USACE on whether, in the future, a program can be developed for municipalities to similarly get a contract to use some of that water once it is released from the dams. 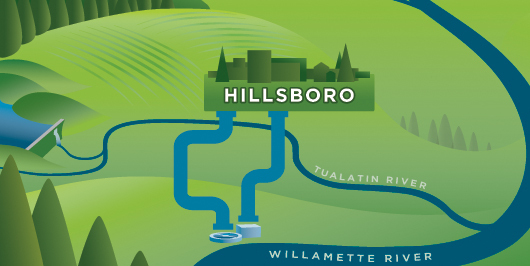 As part of the study, Hillsboro is analyzing the regulatory process of a water exchange with TVID to see if this option is feasible. There is currently appropriate authority to expand the JWC WTP. A pipeline can be sited by acquiring easements, using the public right of way, and utilizing the public utility facility siting statute. The permitting required for this alternative is still in the research phase. All proper permits for the project will be obtained if this project option moves forward. Hillsboro is currently analyzing public concerns, and will post information and FAQ’s as they become available. If you have a concern you would like to see addressed, please click in the Green Box above and leave a comment.